First of all, there are all kinds of design specifications within the Colorado that were crafted with your comfort and convenience in mind. The Colorado’s interior has conveniences such as a heated steering wheel, cloth seats and the unique sound of Bose speakers. The Colorado has terrific technological features. 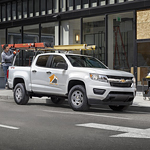 Each 2019 Colorado comes with a great infotainment center that has a host of options, including a great online dashboard and available wireless charging options. The Colorado also has a number of USB ports for your convenience. Does this sound appealing to you? If so, contact Tim Short Auto Mall today and we would be happy to let you take one of these beauties out for a no-pressure test drive!